Cut through the noise, engage in focused discussion––that’s what Kialo (www.kialo.com), a digital debate platform for civic and political topics, claims to offer as a public debate platform. Kialo prides itself on being a “noise-free” forum for individuals to voice their opinions. In an age of pervasive social media and the associated “noise” caused by algorithmic clutters and the echo chambers effect, Kialo promises a more visually rich and rational platform to host complex conversations. Users may either join an existing discussion or create their own topics. Existing topics range from ethics, to education, to economics. The website shows trending topics––those with the most interactions––on the front page. 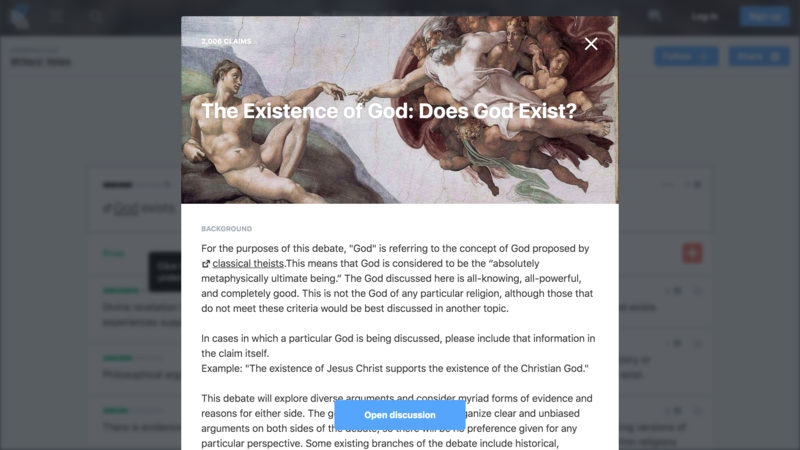 Existing discussion pages come with background descriptions to help users understand the contexts and premises of the arguments. Kialo’s “Explore” page showing existing debate topics ready for users to join. Similar to The New York Times’ Room for Debate, users can see featured individuals and their main claims for the specific topic. The pros (green colored) and cons (red) claims are laid side-by-side to allow visual comparison. The “mapping” feature of Kialo is what makes the platform unique. Following a logical reasoning model, every discussion topic comes with an interactive tree of pros and cons arguments showing the genealogy of a thesis and its claims. Users may click on the pros or cons claims to literally see the line of argument for these claims. The interactive mapping feature of Kialo. Users may review existing claims, add their own, or simply use the impact meters to rate the posted claims. These user ratings are aggregated and presented in a simplified meter on the top of each claim. The rating feature of Kialo. Another important feature of Kialo is peer review of arguments. The site frames this as “user collaboration” but it is in fact a peer-to-peer review of claims and users may make suggestions for other users to clarify their positions, reword arguments, or move claims to under appropriate lineage. Users may also create off-forum comments to bring their conversations outside the formal discussion so they do not “clutter” the channel. The collaboration/chat feature of Kialo. While I have not deployed Kialo in any of my classes, I see clear pedagogical benefits it can bring to a rhetoric or writing classroom. 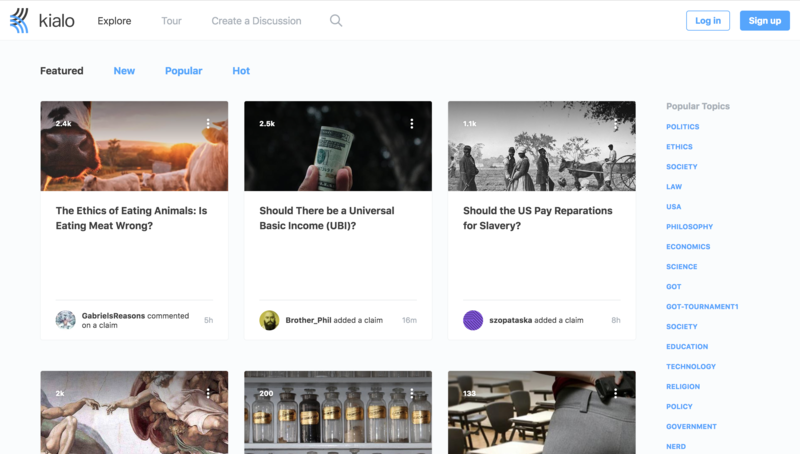 For instructors who assign argumentative writing or debate assignments, Kialo may be a platform for students to research existing viewpoints on common topics. Students may perform comparative analyses by mining the existing viewpoints through archival methods. This allows them to identity themes or patterns in arguing for or against a given topic. They may apply rhetorical theories or perspectives to explain these themes or patterns. Instructors may also create student teams within Kialo to manage group debates, store and share a coherent log of discussions. These teams may be made private so students don’t have to be worried about intrusion by those who are not in their course. These debates and discussions can serve as a prewriting exercise in which students put their opinions to test, and create a stronger thesis based on the discussion points they garner from their peers. Students must be made known of these conditions before they agree to contribute content on the Kialo platform. In fact, this––regarding user privacy, intellectual property, and copyright––can be a debate topic in its own. This is particularly important if the instructor chooses to make student participation on Kialo a graded portion of their course. Second, instructors may also wish to clarify to students that the visualizations of the lineage of claims on Kialo make arguments look oversimplified. While it can be helpful for students to trace the lines of thought, they must learn to detect the complexity of opinions based on contexts, individual biases, values, traditions, and systemic ideologies––all of which are not shown in the visualizations (interactive maps, user ratings) of arguments. Taking these into accounts, Kialo can still be a useful tool for pedagogical use in rhetoric and writing studies. It is an accessible platform that might make debates more engaging and meaningful. For students who are not comfortable speaking out in class, this tool can serve as a backchannel to engage those students. Do you use or plan to use Kialo? Share with us what you think! Thanks for the review Jason. We are working on providing a dedicated private Kialo instance for all edu endeavors. That instance will have a TOS granting us significantly fewer rights, as it won’t have “public” discussions. The reason we have this clause in there is that the owner of a private discussion MAY choose, at a later stage, to publish the discussion, and thereby transform it into a public one. This requires us to have the OK, preemptively, by all users to do so. Naturally we consider private discussions to be just that, private, and will, with a future TOS update, make it clearer that we only require one’s permission to display them to the users that have been invited to them, unless the owner decides to make them public.